William J. Reynolds. Image courtesy of the Southwestern Baptist Theological Seminary in Fort Worth, Texas, date unknown. At the last meeting of the Board of Directors, the board voted unanimously to present a citation award for Bill Reynolds. Bill was a loyal Sacred Harp singer for many years. He also made significant and lasting contributions to the Sacred Harp Publishing Company over many years. 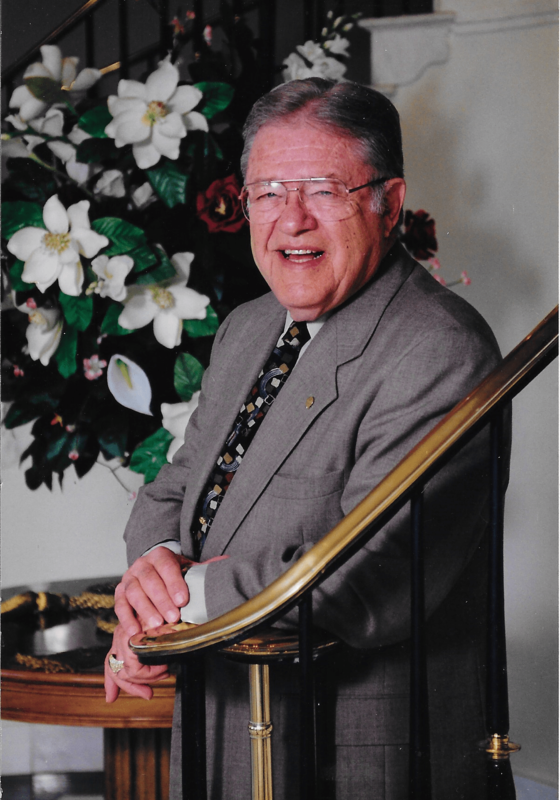 Bill Reynolds was church musician, composer, arranger, editor, educator, and hymnologist. He was also Professor Emeritus of Church Music from the Southwestern Baptist Theological Seminary in Fort Worth, Texas. Bill consulted on the revision of The Sacred Harp in 1971. He was also a “behind the scenes” contributor to the 1991 Edition. Mary Lou Reynolds, Bill’s wife, was not a Sacred Harp singer, but she was an editor. She “volunteered” to read every word in the 1991 Revision and made necessary corrections—what a tremendous labor of love! I first met Bill Reynolds in 1975 at a weeklong celebration marking the introduction of the new Baptist Hymnal for the Southern Baptist Convention. Bill served as General Editor for the hymnal and he was the primary planner for the week’s events. The new hymnal included six tunes from The Sacred Harp, and one from The Christian Harmony. Appropriately, the week’s festivities included a half-day Sacred Harp singing. I attended many of the sessions and evening music programs with Hugh McGraw and my aunt, Ruth Denson Edwards. Donald Ross, Retired Justice of the Texas Sixth Court of Civil Appeals, was asked to make remarks about the long friendship he and Bill enjoyed. Don talked about Bill’s love of the music, his deep resonant bass voice, and the great enjoyment Bill found in singing the music and meeting Sacred Harp singers. In 1992, Donald asked Bill to participate in a special anniversary of the East Texas Sacred Harp Convention. A video of Bill’s remarks recorded by J. C. Harden, aptly demonstrates his deep love for Sacred Harp and his extensive knowledge of the music. Michael Hinton presenting plaque to Tim Reynolds. Photograph by Michael Hinton. The Sacred Harp Publishing Company citation was presented to Tim Reynolds of Nashville, Tennessee, a son of Bill and Mary Lou Reynolds. Tim is an active Sacred Harp singer and sings in two Nashville church choirs. He is also involved with Tennessee singings. 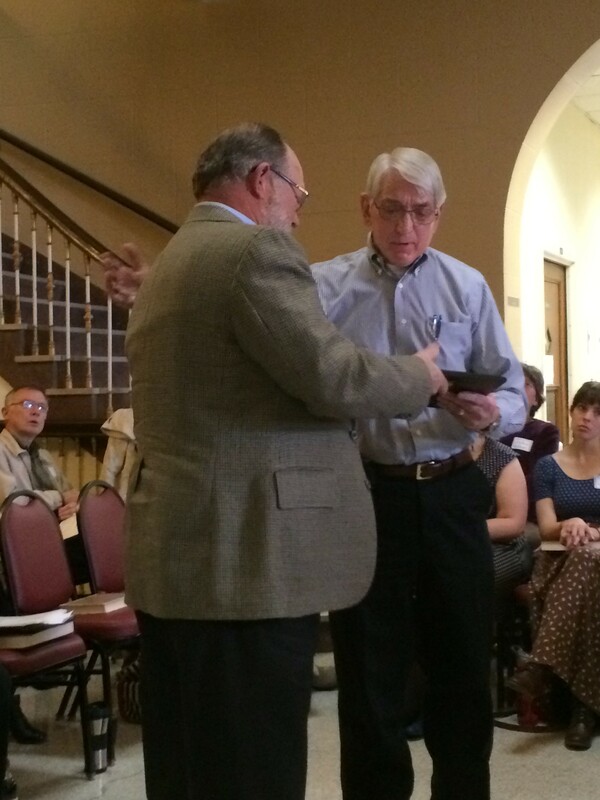 Tim told us that Bill was given a copy of a draft of the 1971 Original Sacred Harp: Denson Revision. Hugh McGraw told Bill that the Publishing Company needed a little help with corrections to the new tunebook. Bill told Hugh that it “would cost a fortune to have someone do all the work that was needed.” Bill had surgery scheduled soon after that conversation and he told Hugh that while he was recuperating he would look at the rough copy. Tim said that as Bill felt well enough to look at the revision he would bring a bedside table loaded with the 1971 draft and several other tune books. As Bill found a note or word that needed to be corrected, he would locate the correct note or word in one of the other books and would then cut it out by hand and paste the correction into the revision copy. It must have taken hundreds of hours to complete that task. The Sacred Harp, 1991 Edition is greatly indebted to Bill Reynolds and his selfless dedication to the music that he so dearly loved. The Sacred Harp Publishing Company is honored to recognize Dr. William J. Reynolds as a tireless supporter and true friend of Sacred Harp. 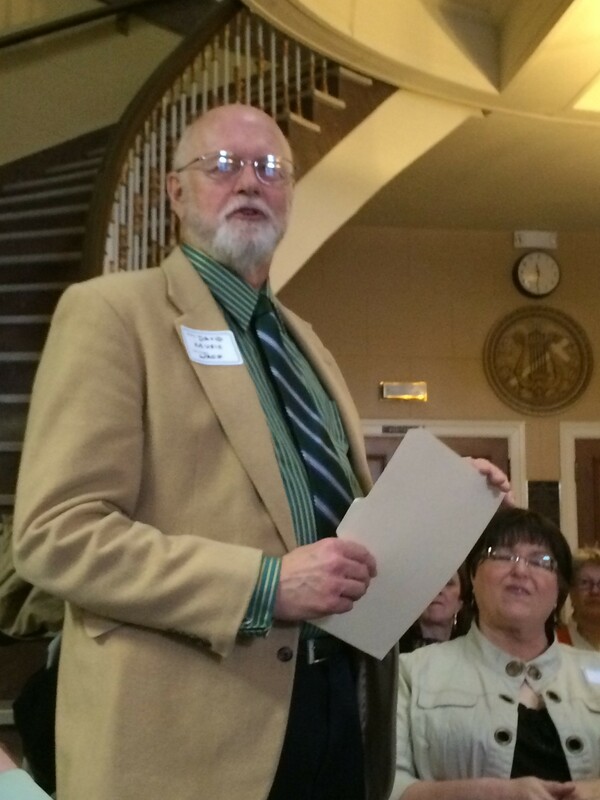 I am grateful to have the opportunity to say a few words about Bill Reynolds, for it was he who gave me my first exposure to Sacred Harp singing. Oh sure, I had read about Sacred Harp singing and even done research on some of its tunes, but it was Bill Reynolds who first introduced me to it as a singer, for which I shall ever be grateful. David Music, professor of church music, Baylor University. He is the author of William J. Reynolds: Church Musician (2013) and long time friend of Bill Reynolds. Photograph by Michael Hinton. For those who may not have known him or his many contributions to sacred music, let me note that Bill was a graduate of Missouri State University, Southwestern Baptist Theological Seminary, the University of North Texas, and George Peabody College for Teachers in Nashville, Tennessee. He served as the second full-time minister of music in Oklahoma (at First Baptist Church, Ardmore, and First Baptist Church, Oklahoma City), then as an editor and later director of the Church Music Department of the Baptist Sunday School Board in Nashville, and finally as Professor of Church Music at Southwestern Seminary. He was a renowned hymn leader and scholar, and a widely published composer. Bill’s leadership abilities were obvious to Sacred Harpers during his days in Nashville. In 1969 he became chairman of the Harpeth Valley Singing (now the Priestly Miller Memorial Singing), and in 1977 he also took over the duties of directing the Peabody Singing in Nashville. He continued as chair of these two singings until his removal to Fort Worth in 1980. Five years after Bill joined the Southwestern Seminary faculty he founded the campus Sacred Harp Singing, the name of which was changed in 2004 to the William J. Reynolds Sacred Harp Singing. We are all debtors to him for the thirty years of singing that have happened annually in that place, and for the many other contributions he made to the spread of the music that we all love. Michael Hinton is the President of the Sacred Harp Publishing Company. He lives in San Antonio, Texas. His grandfather, T. J. Denson, taught singing schools from Georgia to Texas and contributed eight songs to The Sacred Harp. David W. Music is professor of church music at Baylor University and the author of numerous books and articles on hymnody. David has chaired the Baylor singing since 2002. He learned about Sacred Harp singing as a fellow faculty member of William J. Reynolds. This entry was posted in Friends Who've Gone Before. Bookmark the permalink.